Over the last few weeks, during several inservice sessions, I’ve shared this simple, yet keenly purposeful way to get even the youngest children writing. Parents/teachers have raved about the idea, so I thought I’d put together a short post. Here’s the scene: You’re driving and realize it’s time for dinner. You stop at a McDonalds’ drive through. The line is hideously long. You, being a clever encourager of writing in all ways all days, reach for a sticky note and scrawl, “I love you. You’re a great kid!,” passing it back to your child. Kids love writing notes back and forth and, with our lives as busy as they are, brief stops like this while traveling in the car present perfect opportunities to encourage a bit of writing. I’ve done this with my son since he was very small and he writes sticky notes for all kinds of reasons now (actually if you refer to my Nov. 13, 2013 post, you’ll see sometimes things have gotten a bit out of hand). In fact, he’s an avid six year old writer who views writing as just part of the stuff he does every day. This is one strategy that helped get the writing ball rolling. P.S. Just for fun: Here’s a poem (Poetry Month!!) 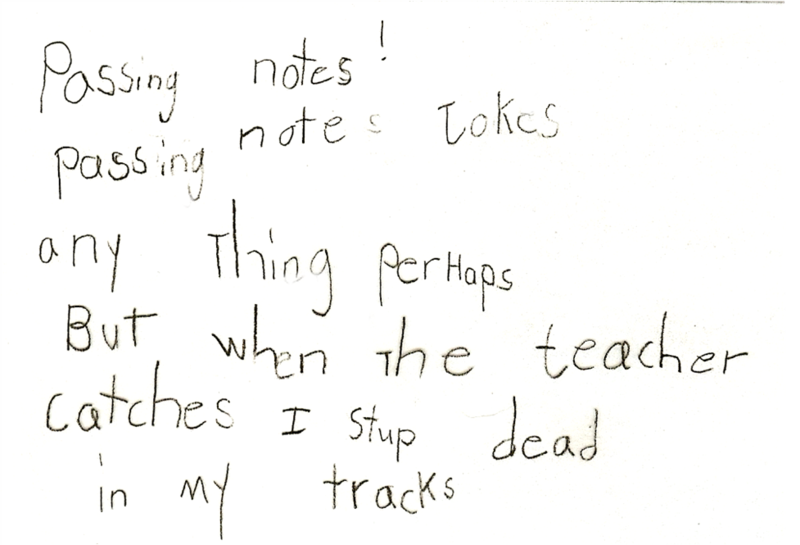 written by one of my second graders about passing notes. Enjoy and go pass some notes!